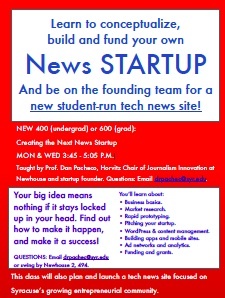 Welcome to the Next News Startup! Everything you need to know to participate in the course can be found here or through links on this page.Are you interested in creating a news or civic media startup, but not enrolled in the class? Or are you an alum from a previous class? Feel free to follow along and participate through our Rebelmouse page at the right, or the Spundge notebooks at the bottom of this page. Learn more about the class and download the syllabus. Entrepreneurial Journalism by Mark Briggs ($14.75 eBook on Amazon, also available in print at the University book store, or through Amazon). Making the Leap Beyond Newspaper Companies, both available for free download from the NAA. Occasionally the NNStart class has amazing guest speakers, visits or field trips that we record with permission. See the videos here. Members of the class share stories commentary in a Spundge notebook. The 20 most recent posts appear below, as well as the class curation page. Fall class meets Monday and Wednesday from 3:45-5:05 p.m. Click above to download a flyer.